All of a sudden, we have baby fish! Goldfish? Koi? What next? We have a large pond, 2 sections, upper smaller pond - about 2 feet deep and 5x5 feet in size, in full sun, the lower pond, 1-4 feet deep and about 20 x 8 feet in size, with a waterfall and a long river bed connecting the two sections. The waterfall recycles the water from the bottom pond, not feeding the upper pond. The upper pond is fed separately by the lower pond. We have 7 fish in our lower pond only. 2 Koi - 6-10 inches and 5 goldfish 4-6 inches. There are lots of snakes (garter and ribbon), and green frogs established in both upper and lower sections. In March, 2016, we had the pond completely emptied and cleaned. They removed the fish and some frogs and put them in a kiddie pool during the process, and removed all of the algae and such, power washed the rocks etc. (We moved to this house in October, and didn't have experience with ponds as of yet). 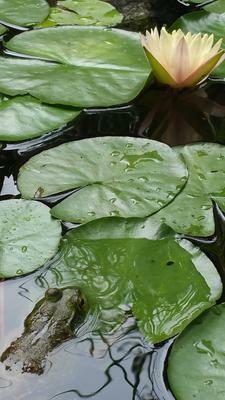 The pond over the spring/summer re-established all the wildlife (frogs, snakes etc,) in no time. The string algae was back by July which we tried to control by removing as much as we could but left some for health of the pond. We don't feed the fish - they eat the natural algae.. In July, we noticed 4-6 small gold-colored fish in the UPPER pond. I am assuming they are goldfish. Perhaps because I moved some water hyacinth from the bottom pond to the upper pond to help combat the string algae that was overtaking the upper pond (full sun). I read that fish fry turn gold after a year? So are those goldfish (about 1-3 inches in size now) a year old? Now, in August, we started seeing small black "minnow" looking fish in both the upper and lower ponds. Are they also fish fry - or baby fish? I'd like to know what to do (or what steps to take) to continue a well balanced pond. There are at least 50-100 small minnow like fish between the two ponds. I am hesitant to put the "new" goldfish into the bigger lower pond in fear of them becoming koi food, but the winter is approaching and only the lower pond will have the ice breaker heater in it. I hope I gave you enough information. Please let me know if you need more specifics. Looking for steps to proceed towards winter. Thin the herd? Move the fish? Either you've transferred water hyacinth with eggs attached, or the water circulation system has pumped fry from the bottom pond to the top. Hyacinth is an ideal spawning medium for Goldfish or Koi to lay their eggs on. Because of their size more than color I would guess the 1-3 inch fish are last year's fry. Goldfish can start coloring after just 90 days, depending on food, water temperature and genetics. It would be a fair bet the small black minnow fish are Goldfish fry from this spring's spawning. Goldfish start out silver gray, turn black, then slowly the black starts to fade, being replaced by light gold coloration. Once the fish has turned fully yellow gold, the color will start to deepen to dark orange/red or gold. (Note, not all of the fish turn gold, some retain their natural wild coloration. More on this later). Both Koi and Goldfish are cannibalistic so you are correct that the smaller fish could be in danger of becoming a meal. Having said that, Koi and Goldfish aren't aggressive towards other fish, so quite large size differences can be kept together. If the smaller fish can't fit into the mouths of the bigger fish, they wont be eaten. 50-100 fry are too many for your system to support, especially as you don't feed them. If you let nature take its course, as the fry start to color, they become easier targets for all the wildlife living around and in the pond, including birds. What will happen is a lot of the colored fish will "disappear" and more of the dull (naturally) colored fish will survive. Over time, the dull colored fish become the majority, which is not what you want. 1. Establish if the fry are Goldfish or Koi. Koi have a barbel at each end of their mouths. The reason for establishing this is because Koi grow much larger than Goldfish. 2. If the fry are Goldfish, and you want to keep a few, say no more than 6, you need to select those that are turning gold and either move them indoors over winter, or leave them in the top pond as long as it doesn't completely freeze. At anything smaller than 2 inches in body length they will struggle to survive over winter. If the fry are Koi, the same applies, but you wouldn't want to keep as many because of the size they grow to. 3. Sell off or give away the rest of the fry. This will be a problem each year as your fish are at a size and age when they will spawn around late June, early July. If you don't reduce the numbers, competition for food will mean all the existing fish will start to suffer, and building up fat reserves for winter will become harder and harder, resulting in early spring losses.